And that's a wrap!!! I hope you've enjoyed Stick Cats Act III. I know I had an awesome time drawing it. Act II will be happening at some point in the future. You'll get to learn about all the crazy events that transpired between Stick Cats #20 and Stick Cats #22 (hint: Stick Cats #21 is a teaser of their journey). However, I don't think I'm going to post it one page at a time. Expect to read Act II in chapters instead. 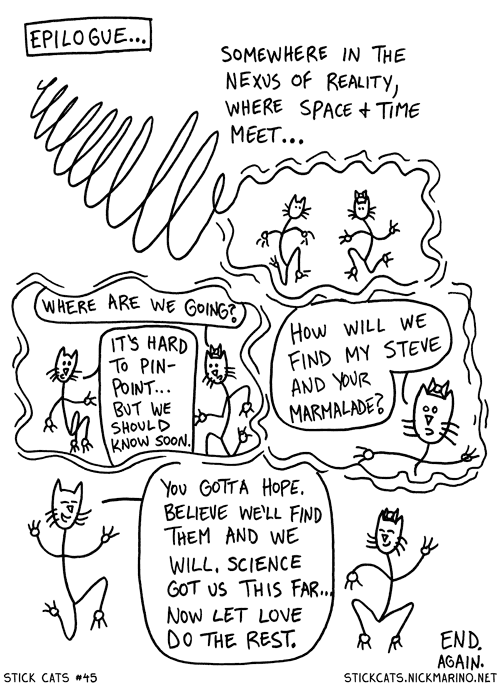 In the meantime, start following Stick Cats on Facebook to stay up-to-date on the progress of Act II.